We new (and even you veterans out there) Mommy's are bombarded with sew many new products each day and every one of them claims to be the solution to all your needs. By far the greatest "invention" of modern mommy society is that of the baby carrier. Since there have been babies there have been baby carriers! Baby carriers come in all shapes and sizes with buttons and buckles and straps and instructions and pockets and hoods and you-name-they-got-.its. They also come in an astounding variety of colors and sizes and thickness or thinness. You may prefer one with buckles and straps but I prefer the versatility of a wrap. I started out, like most mommies who are diving head first into babywearing, with a Moby. A Moby is a brand of wrap that is about 5.5 meters (about 18 feet) and about 21 inches wide but since it is a knit material it stretches a little longer and wider. Many of my fellow babywearers have referred to the Moby as a gateway carrier. That is because the Moby is just plain awesome but it does have a few setbacks because it is made of a knit material. Knit material will stretch in one or a couple different directions where as a woven material does not stretch! The Moby company will tell you that it works from newborn to 35 pounds but most of the baby wearers I know prefer to switch to a woven wrap at about 15 pounds. This is because the material will stretch out and the baby will begin to sag. The Moby D (made by the makers of the Moby) has a woven center panel but the same knit straps so it kind of defeats the purpose. An original Moby wrap will set you back between $20 (used) and $80 (new organic/UV resistant fabric). A Moby D is also a bit more expensive than the original Moby wrap. I also felt that the Moby was a little warmer than a few of the other wraps I have in my stash. This is not a bad thing since I would typically chose the Moby for walking down the pier to visit my husband at work in winter but if it were the dead of summer in Florida I am not so sure I would be wearing it for too long! Since my baby has passed the 18 pound mark we have been using the Moby less and less. I find that after about 20 minutes she is sagging down to my pelvis and its just not comfortable for both of us! A fellow babywearer recommended a woven wrap. But what is a woven wrap? It is exactly the same thing as a Moby but it is made of woven material not of knit material. 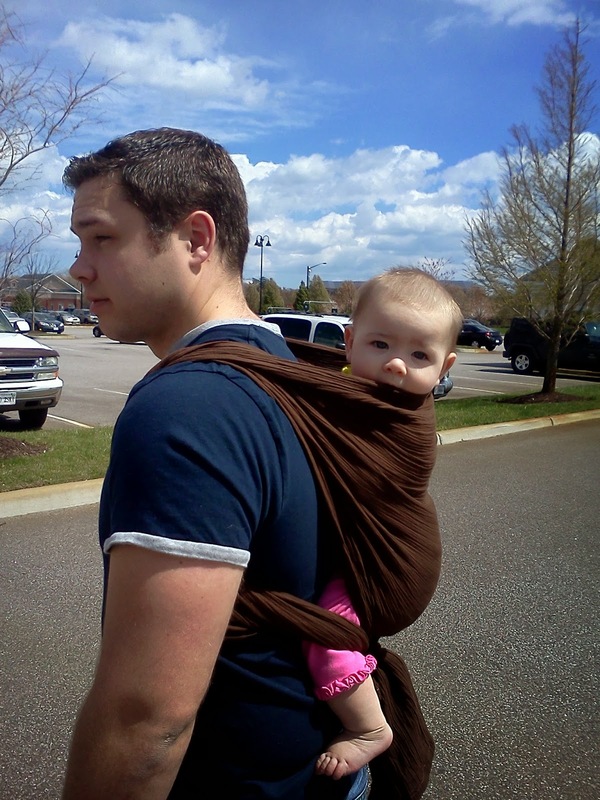 This allows you to wear a baby up to 40 pounds and also carry them on your back. I have seen a few pictures and videos of people wearing their baby in the Moby on their back but the makers of the Moby no longer post instructions on how to do so because it is unsafe to wear your baby in a knit wrap on your back. Your baby can sag or twist just right and fall out. Do not try to wear your baby on your back in a knit wrap. A woven wrap will set you back about $40-160 or even more depending on the color and trim or design. But you can make your very own woven wrap for $2.50. I have made about 10 woven wraps so far for myself and friends. They are by far the easiest thing you could ever make because honestly all you have to do is be able to sew a line! Typically you will want to chose a fabric that will be thick and strong but you don't need it so thick that you will be hot wearing your baby all day. You also want something kind of soft because it will be against baby's skin. I have chosen a linen material and a gauze material and I really like both. I have also been able to borrow and try out a few different materials from a local baby wearing group. So I have tried thick, I have tried thin and for me I like the thin! As a general rule though I will say that the thinner the material the wider you will want your wrap. This will prevent you from having any pain on the pressure points and will help distribute the weight of your baby more evenly allowing for a more comfortable baby wearing experience. Personally for me the "golden" width has been about 30inches. Which is quite convenient because most fabric on the bolt comes in 60inch wide. So I can make 2 wraps for the price of one! One for me and one for my friend, or the car for that matter! The hardest part of making your own woven wrap is choosing a fabric. I like to see what's on sale and that usually helps me make my decision. The sale fabric also helps me decide on how long my wrap will be since the clearance fabric is usually remnents of some sort. The shortest wrap I have made is just under 3 yards. I can really only do a couple different carries with it but it is my favorite to use when we are out and about because I can throw it on quickly and get my shopping done! A good standard size to go with is about 5 yards. That will allow you to do just about every carry. If you are thinner or larger you will want to adjust accordingly. I am a typical medium/size 10-12. Also you may want to chose a fabric that doesn't have a "right" and "wrong" side. Meaning the fabric has a nice side and an ugly side (you don't want that). Once you have chosen and purchased your fabric you will have to cut it to the length and width you have chosen. You can also chose to taper your ends or leave them squared. And then I would recommend that, if it is your first time, you iron your hem. You will fold all the ends over about 1/2inch and then fold that over again about the same width. Press that fold (set your iron to whatever setting is best for the fabric you have chosen) nice and tight so that it holds well so that you don't have to mess with it while you are sewing. Or you can skip this step and as you sew roll the hem yourself. I typically use the tip of my finger to gauge how wide the hem should be. You will hem all the edges so that they do not fray. On the corners you may want to cut a little triangle out so that it is less fabric for your machine to have to power through this is especially important if the fabric you chose is particularly thick. Here's a video to help you along. And here is a picture to give you a general idea of how the wrap will be. Yes, a wrap is seriously just a long piece of fabric! Feel silly for ever considering buying one for $50 or more!? I will post some videos on different carries when the baby is not so sassy! Happy sewing everyone! I hope your project was a successful one! Feel free to post your experience with making a wrap. What fabric did you chose? How long and wide did you go with and how does that effect your baby wearing? Was this your first baby wearing experience? I hope it has made your life just a bit easier! And now that you have a wrap you can get more sewing done because you can wear your baby and sew simultaneously! **UPDATE** the wrap in the video above is now 3 years old and still in use today! Daddy wearing baby number one! Going on FIVE years and 3 babies this little gauze wrap is still in use today! Haha. You're hilarious and your baby is adorable. Thanks for this tutorial. Do you have a direct on-line link to where I can buy some woven fabrics suitable for making a wrap? I'm just not sure where to start for that! I was wondering if you had a name of the fabric. I KNOW that I can make myself a wrap and I really don't want to buy some boring fabric. I want a print or something. I read both this and your updated post but I have no idea how I could do it for 2.50 or $2.50 a yard. Do you have fabric purchasing tips (USA)? I had a queen size flannel sheet that I didn't use anymore and it was just sitting there in the linen closet, so I made two of them out of that, so it was free! If you do not mind having weight distributed across rather than up and down your torso, you may prefer the "sling" style. It is reported that the "sling" style makes mommy feel closer to the baby but really does nothing to encourage head strength and thus, is not used as long as a "pack" style may be used.